This post is provided by our guest blogger Thomas Gegenhuber, who studies Business Administration at Johannes Kepler University in Linz and is a regular contributor to wikinomics.com. He participated as a live-blogger at the Free Culture Research Conference 2010 in Berlin. Geert Lovink, who held the keynote at the Free Culture Conference in Berlin, believes the facebook problem is rooted in its business model. At the end of the day, facebook needs to monetize people’s social graph. He highlighted that some services address this problem. “Sepukoo and the web2.0suicidemachine allow you to remove your data; other services enable you to download your data.” Evolving alternatives like Appleseed and the more famous Diaspora are still in the early stages. Lovink also highlighted new revenue models and fundraising possibilities:. “SellABand and FabChannel are failed but noble attempts”. However the Diaspora buzz skyrocketed after it was able to successfully raise funds on kickstarter. Kickstarter, the “new fund to fund and follow creativity”, enables projects that would not have been seen by the eyes of a broader audience otherwise. In Austria, the project respekt.net applies the principles of kickstarter to political non-profit projects. In addition to raise funds, respect.net members can additionally offer time to support the projects or share their knowledge. The business models of most ideas can be analyzed fairly easily. Nevertheless we need to know more about the micro- and macro economical effects of a “hybrid economy”, defined as a blending of the commons (free culture) and the market. Ignacio de Castro Arribas from Spain analyzed the economics of peer-production and prosumption on an individual and market level. He observes networking effects between two markets. For example, a company gives away software for free to stimulate demand in the market where the company offers services. He also pointed out that successful peer production (like in the case of Wikipedia) creates high barriers of entry for other players. Indirect appropriation: the hope of future earning and signalling effects (exposure). Furthermore there are Mincerian effects, e.g. : I participate in Linux so IBM might hire me. Hedonic rewards: Ego boosting and the pleasure of consumption. Monetary rewards: e.g. : Chance to win a cash prize in web-based contest. Network effects play a crucial role to amplify the incentives: The more passive users a platform has, the merrier the platform is attractive to active users. The signalling and ego-boosting effects for active participants are higher if they know they have a big audience. Although this study on the microeconomics of the hybrid economy is interesting, we still lack knowledge about effects on the macro level. A different approach to examine the macro-effects of the shifts in the music industry was presented by Leonhard Dobusch and Elke Schüßler from Freie Universität Berlin, who examined in their paper the discourse on copyright regulation. Their focus: conferences play a key role in shaping the development of a market. 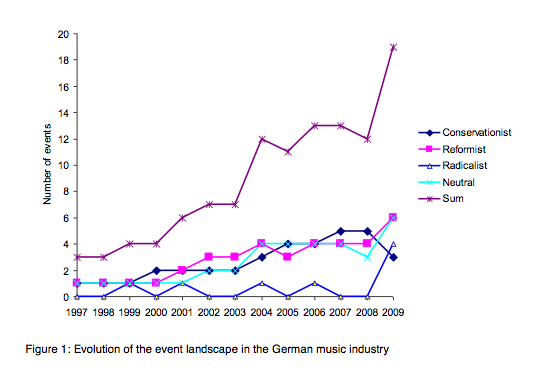 Therefore they conducted an event ecology analysis and a comparative in-depth discourse analysis of three key events in the German music industry, the popkomm, the c/o pop and the all together now. Generally, the thriving event landscape indicates that the music industry suffers not from depression; on the contrary, it is a thriving industry. There are two key findings of this paper. First, in mainstream media, conservative voices play a major role. Second, organizing „events [is] a powerful mechanism to influence the public copyright debate.” These findings complement the thoughts of Volker Grassmuck. In his presentaton, he debunked myths about the alleged results of P2P-filesharing in the music industry. He reviewed numerous articles in the literature and came to the conclusion that P2P-filesharing is not responsible for the decline of CD sales. With the emergence of every recording technology, the sale of the previous recording technology dropped sharply. In this context, Grassmuck coined the term “Digital Right Management Hole”. People were aware of the power of the web; the music industry offered no channels to buy MP3 online, which fostered the emergence of P2P-filesharing. A recurrent theme throughout the conference was whether and what new business models will emerge, which are compatible with commons and free culture. Still, the positive and negative effects of these new patterns on society are understudied. For example, Geert Lovink explicitely mentioned his disapproval of “the “Lessig-style” view that artists in the future will need to have a “Walmart” day-job.” Whether this is an accurate summary of Lessig’s position was another heavily debated issue during the conference. More impressions and reflections of the Free Culture Research Conference 2010 can be found in the Conference Wiki.